The contrasts could hardly be more pronounced. Youthful vigour versus dulcet experience; aesthetic abstraction versus trad narrative; cool objectivity versus tear-jerking melodrama. 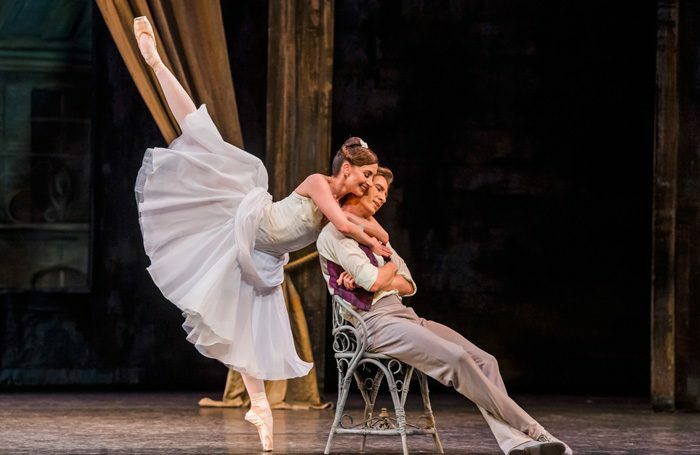 Yet Liam Scarlett’s debut ballet has more in common with Ashton’s popular crowd pleaser than one might imagine. A work of controlled lyricism, it is deeply romantic and pays tribute to classical ballet structures and themes while bending them into new shapes. At 24, Scarlett demonstrated a choreographic maturity beyond his years; undaunted by stillness, his management of groupings and duets, the fluidity of his designs and the respectful way he reframes classicism with an accelerated sensuality is enormously appealing. The sliding black panels and harsh neon lighting are ultra modern, the flesh coloured and brown velvet costumes are coolly fashionable but the dance itself is timelessly lyrical and illustrates Poulenc’s lush and lively music without being enslaved by it. Scarlett’s spirited work is enhanced by small but telling details – little synchronised jumps, the flutter of fingers around a waist, a hand placed across a mouth – that colour it with humanity. Brought back into the repertoire by popular demand, Ashton’s shamelessly sentimental romance might be subtitled When Doves Fly. The story of a young painter who tires of his fidgety girlfriend/model and runs off with a gypsy girl requires utter commitment from the dancers – any hint of irony and the piece would collapse. Vadim Muntagirov and Lauren Cuthbertson are old hands at this and they have developed a comic chemistry that is both amusing and believable. Their mutual sulking is hilarious but her grief at his departure is quietly touching. Laura Morera is great as the gypsy temptress but her fellow Romanies are a little too pretty and polite for my taste; their settlement is more holiday camp than gypsy camp. The doves, I might add, behaved themselves impeccably.